We arrived to Colmar and magically the rain stopped. We are staying in a cute bed and breakfast about 15 minute walk from the old town. Colmar is charming and story book like. The town is on the Alsatian Wine Route and considers itself the capital of Alsation wine. We are using Colmar as a base for the next 4 nights so pictures of the adorable town will be coming another day. Since we are in a Euro country, the food is much cheaper. We actually ate out tonight and we had a couple of Alsatian dishes. 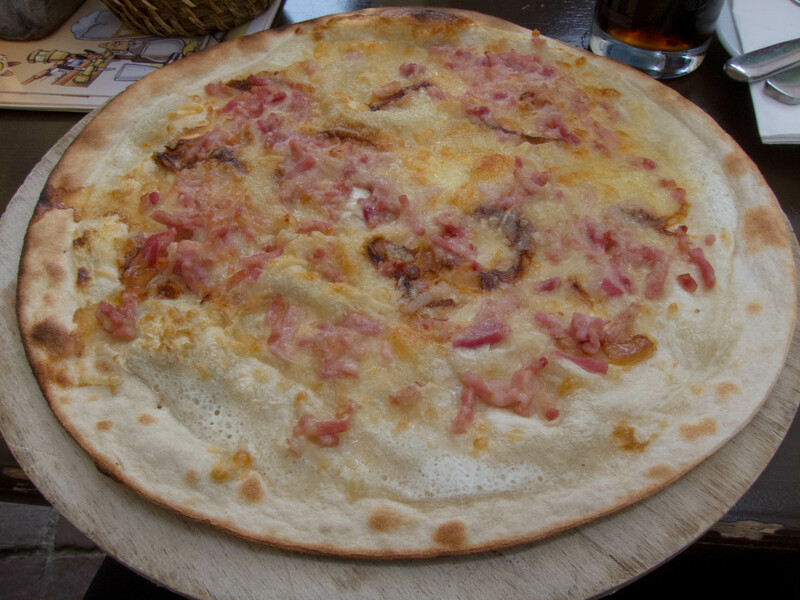 This is an Alsation pizza. It had cream, shallots and bacon. 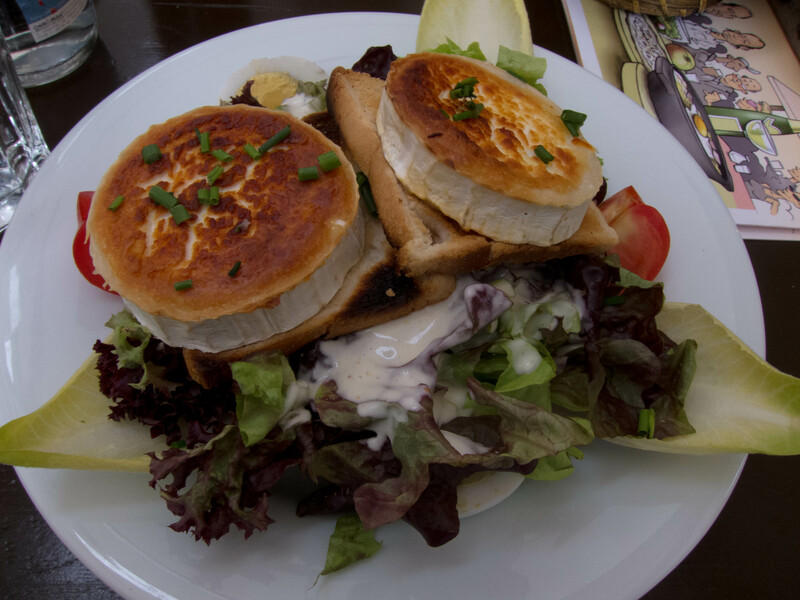 This was a salad with fresh goat cheese, toast and egg. Here is a rainy video of Murten. Today was a travel day from Vevey, Switzerland to Colmar, France. We have been so lucky with all the blue sky, but today we had a little rain and gray skies. It was fine though since we were driving most of the day, and I don’t mind a day with out the sunglasses. Since we couldn’t check in to our inn until 4:30 we stopped in Murten and Basel Switzerland. I thought Murten was a cute little town. Most of the shops and restaurants were closed since it was Monday, but it was a nice to walk around. I didn’t take many photos in Basel as it was a little more rainy. Basel is pretty unique as it is located in Switzerland but has suburbs in France and Germany. The Rhine goes through Basel, and the river is big enough there to have larger ships carry cargo out to the North Sea. Most of the pictures are of Murten. The only picture of Basel is the very red building which is the city hall. Here is a short video of Geneva. We spent the day driving around Lake Geneva which is about a 2 and half hour drive. The lake is the largest in Europe. We stopped in Geneva which was about half way of our drive. Geneva is one of the larger cities we have visited, and they also have the most parks– 20% of the city is covered in green space. There were plenty of people out exercising and enjoying the Sunday. We parked in the center of the city and walked around the waterfront for awhile. They have a large water display, the Jet D’Eau, in the lake. It shoots so much water in the air that at any point in time there is 7 tons of water in the air. We walked to one of the parks which happened to be a botanical garden. 🙂 I don’t think I ever get tired of taking pictures of flowers. It was actually a pretty nice botanical garden considering it probably is pretty cold here in the winter. Tomorrow we leave Vevey and head to Colmar, France. We took an hour boat ride from Vevey along the shore line of Lake Geneva to Château de Chillon. Chillon is a castle that consists of several centuries of different construction. The first written record of the castle is around 1150. We spent some time climbing many stairs to different parts of the castle. From Chillon, we walked 45 minutes along a beautiful path to Montreux. The path is lined with flowers along the water, and there are no cars. Montreaux has a famous jazz festival every year in July. I don’t know much about music but apparently, Queen was famous in Montreaux and even wrote a song about Montreaux. The alphorns used to be used for communication in the alps. Most people at the market were drinking a glass of wine at 10 in the morning. I didn’t get quite how it worked but I think you just pay money for the glass and then you can fill up your glass as you want. We are staying 3 nights in Vevey. Vevey isn’t a main stop for tourists which is probably one of the reasons why we picked to stay here. Vevey is the headquarters for Nestlè chocolate, and milk chocolate was invented here. Charlie Chaplin is one of their most famous past residents. On Tuesdays and Saturdays they have their big market where people gather to have wine, buy produce and listen to music. I was excited for the music today because the Alp horns were the main feature. We were also lucky today because it was their lake clean up similar to our beach clean up. I was shocked at how many bikes and shopping carts they found in the lake. They had scuba divers going down and bringing up all the trash. Our hotel is not in the main part of town. It is about a 15 minute walk from the main square to our hotel. We actually didn’t see our hotel the first time we drove into town. This is probably because our hotel has a gas station in the parking lot. I remembered seeing a gas station but I didn’t see that it was also a hotel. Funny the pictures of the hotel on the internet don’t show a gas station.